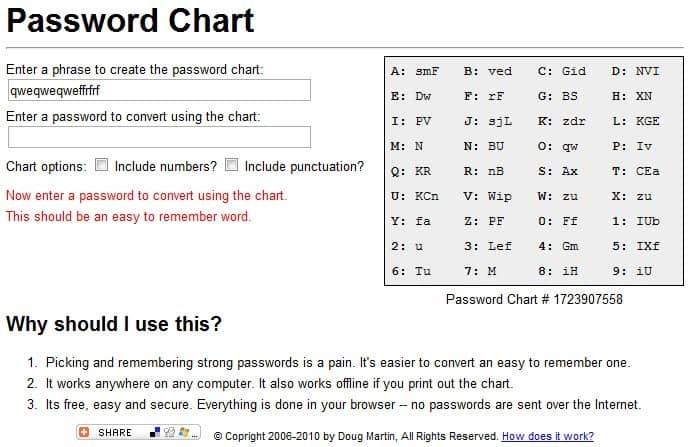 Password chart is an online service that helps you improve the quality of your passwords.How it does so is pretty easy: you enter a phrase to create a random password chart. It is important that you enter some text here so that it is created randomly.An example is "Make your passwords stronger with passwordchart.com" or "https://www.ghacks.net/ is gr3at". You do not need to use words or a sentence, any characters will do. The password chart is then generated and displayed on the right. If you want, add numbers and punctuation to the chart for added security. If you do, you will notice that they are added to the right. Each letter and number of the password chart is now linked to one, two or three characters. If we take the example below, A is substituted by smF, E by Dw and 8 by 1H. You will only see upper and lower case letters here if you have not selected to include numbers and punctuation. You can use the chart online right away. To test a new password, simply enter a basic word or phrase in the second line on the page. All characters that you enter will be substituted so that the password is way more complex than the selected word or phrase. If you select Test for example, you end up with CEaDwAxCEa as the password. The good thing about this is that you only need to remember the word or phrase you entered and not the complex password. For that, consult the chart and all should be good. It is of course not really convenient to remember 88tr3? or larger sequences but that is not necessary either. Save or print the password chart and look it up whenever you forget the new password. Printing would be even better than saving it to the computer because no one on the Internet will have access to your password chart then. My thanks fly out to Thunder7 who found this website and is sending me a lot of great links. Keep up the good work Thunder, I really appreciate it. There is no option to open the password chart again on the Internet site. Make sure you save it to your local system or print it to avoid losing access to all your passwords. Update: An alternative would be a password manager like KeePass, Dashlane or LastPass which can all generate secure passwords and store them for you in a protected environment. you only need to remember one password this way to access the storage of the password manager.